What Makes Kenya's Marathon Runners The World's Best? : Goats and Soda Kenyan distance runners won both the men's and women's divisions of Sunday's New York City Marathon. A Harvard evolutionary biologist suggests some possible reasons why. What Makes Kenya's Marathon Runners The World's Best? 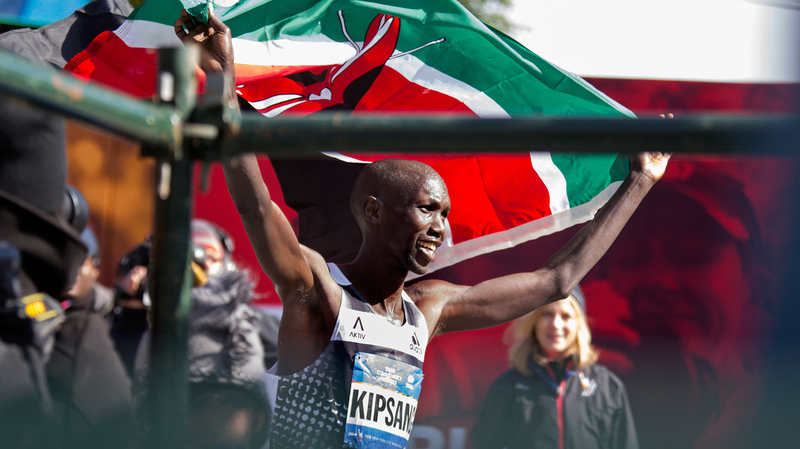 Wilson Kipsang of Kenya hoisted his country's flag after winning the New York City Marathon on Sunday. Kipsang won in an unofficial time of 2 hours, 10 minutes, 59 seconds. Wilson Kipsang, the Kenyan winner of Sunday's New York City Marathon, told reporters after it was over that he'd had to slow down — to "exercise a lot of patience" — as he logged the first miles of the 26.2-mile race. And even with his purposely slowish (!) start, he completed the marathon in two hours, 10 minutes and 59 seconds. Kipsang wasn't the only standout Kenyan in the race. Mary Keitany and Jemima Jelagat Sumgong placed first and second in the women's division. Other Kenyans are leaders as well: In September, Dennis Kimetto ran only his fifth marathon in Berlin and broke the world record and the 2:03 barrier, finishing in 2:02:57. It's impossible to measure exactly what makes for marathon gold, says Daniel Lieberman, a professor of human evolutionary biology at Harvard and the author of The Story of the Human Body: Evolution, Health and Disease. But Kenyan runners may possess certain qualities that drive their ability to win. 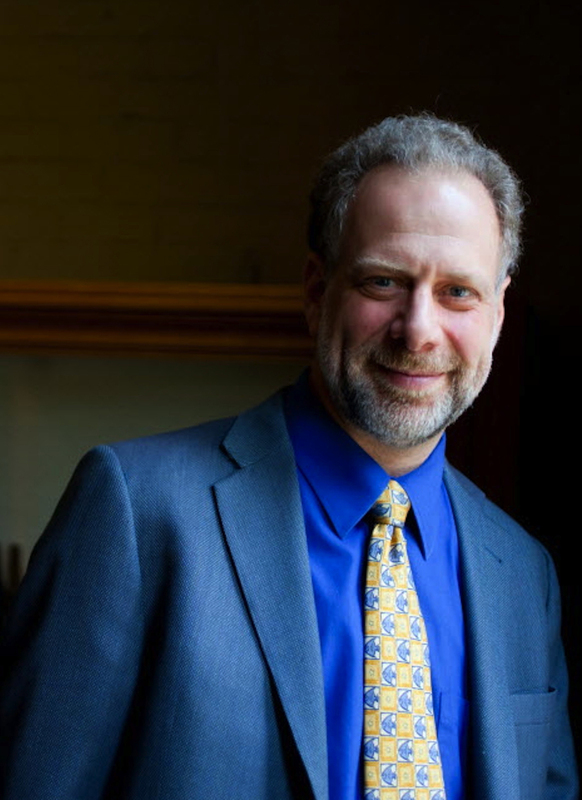 Harvard evolutionary biologist Daniel Lieberman has studied the evolution of running. Lieberman has spent years studying the evolution of running, including the biomechanics and physiology of children and adults who run in rural and urban regions of Kenya. He shared a few thoughts with Goats and Soda on what he's learned. Why are Kenyans winning so many marathons? It's a fascinating question — why Kenyans are so fast, so dominant at the moment. Ethiopians are also doing extremely well. But really, if you really look at finishing times, runners from Africa are only a little bit faster than the rest of the world, just a few minutes faster over the course of slightly more than two hours. I don't know a definitive answer, no one does. So everybody just guesses. It's impossible to quantify all of the factors that make one runner better than another. It's probably a combination of training, determination, culture and biology. How might their environment shape a young runner? The area of Kenya where a lot of the best runners come from — the Western Rift Valley — is a beautiful, wonderful place. If there is any one factor that leaps out at me, it is how many people [in that region] are poor and work hard. There are almost no jobs apart from subsistence farming. There are no factories, and very few secondary schools. So there are really few options for young people to better their lives. They can either work hard on a farm or train to be a great runner. So aspiring runners work really, really hard when they train. In addition, most kids usually run to school barefoot, which I think has some effect because it means they grow up being excellent runners [because, as Lieberman has written, barefoot runners tend to strike with their forefoot or midfoot, which is less stressful than landing heel first]. And the region is at high altitude. All together, this part of Kenya has a large population of incredibly fit runners who run barefoot and work hard. Do they have any special training secrets? They train with incredible heart, motivation and intensity, without any of the advantages that Americans get. Aspiring runners in Kenya get no goo, no gel, no sports drinks. They have no trainers or sports medicine experts. When people train hard for years and years, I suspect that has an effect on their ability to race compared to people who have it easier. Is there a running gene, an athletic gene that researchers can pinpoint? The efforts to find genes or other factors have mostly failed. There's no smoking-gun gene. That doesn't mean these genes don't exist, but no one has found them. You've studied VO2 max, or maximum oxygen uptake, levels in young Kenyan runners. This refers to the maximum amount of oxygen an individual can utilize during intense exercise. We have found that young Kenyan kids from rural areas who do a lot of running have incredible VO2 maxes. They have VO2 maxes most of us would dream to have. It's probably due to a combination of factors: that they're very active and living at high altitude and perhaps some genetic component. When you see kids in the morning going to school, they're often running. Kids travel some seven to 10 kilometers a day on foot, often running. How many American kids run to school every day? Is there a critical point in the marathon when Kenyan runners seem to gain the advantage? The marathon really starts at miles 18 to 20. The pack runs together up to then. The folks who win still have gas in the tank at the end, and are able to sprint the final miles. How are changes in lifestyle, food, or other things in Kenya over the last couple of decades affecting health and running among youth? We're studying this right now. As development sweeps through Kenya, in the urban areas, there are more processed foods, more public transportation, more desk jobs. Chairs all day long. We've done studies measuring fitness and strength in people growing up in towns versus those growing up in the countryside. The differences are astonishing. I now see signs along the road in Kenya for diabetes clinics, which I never used to see in the old days. Health problems are arriving as development occurs. But I don't see this in the rural areas. One of the fascinating things about Kenya is that few people exercise for fun. When runners there retire, they stop running. It's a business. As a result, people don't jog to stay healthy as they age. We've been working on getting people there to think about [running] not just as a way to train but as important for everyone, for health.